This is a screen shot from this morning. 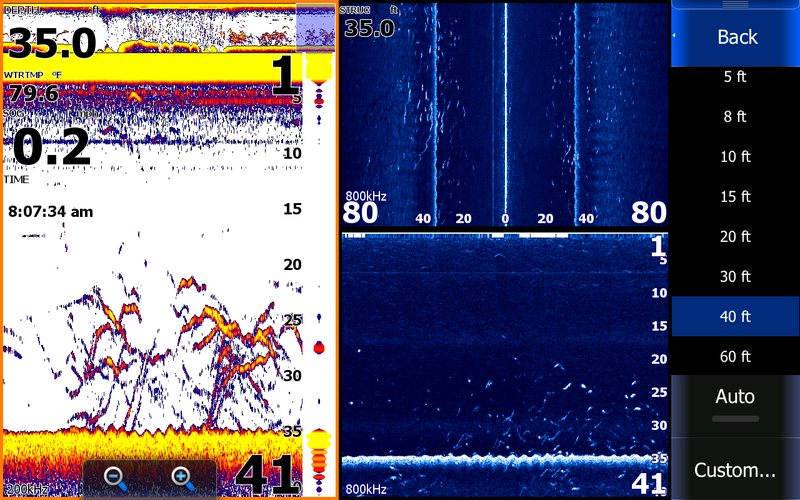 You can see Stripers on the sonar but they really show up 40 to 80 feet out to the left of the boat on the side scan screen. These are much nicer Stripers all of which were keepers. 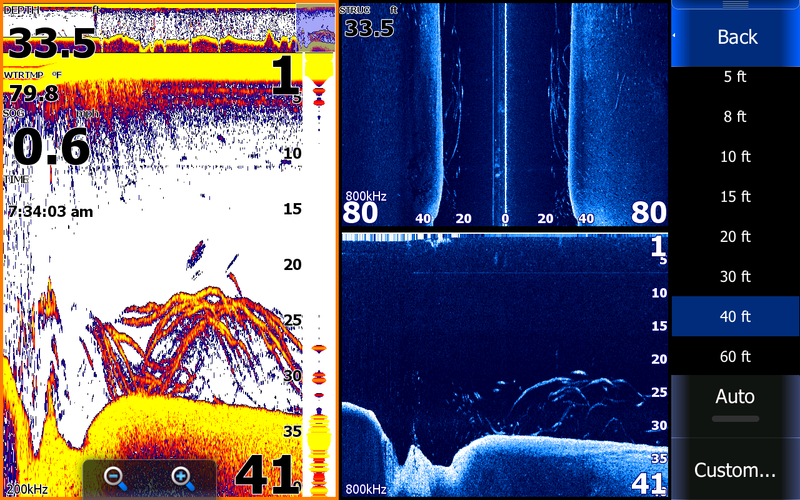 Notice the size of the arches on the sonar compared to the upper screen shot on the sonar and down scan. The side scan clearly shows Stripers on both sides of the boat but larger fish are out 50 to 80 feet to the right of the boat. Naturally I steered the boat a little to the right and hooked up with better fish. This technology is SO good it is almost like cheeting! and purchase a Lowrance. Its that easy. These units work just as well for other species of Fish. I caught bait early this morning then picked my clients up at their dock at 5:45. I motored less than 1/2 mile and saw what I wanted so we set up on some Stripers. By 6:30 we had 14 keepers in the box and had released 20 others. We left that school, motored about 400 yards and found another. Set baits out and worked them again. After ten minutes I wanted to check some other areas out so we took off again but only made it about 1/4 mile before the screen lit up. We banged them again and limited out by 8:30. Today was all about the boys, they were cat fisherman and I told them before we left the dock I was going to convert them over to Stripers this morning. The youngest caught three Cats on our first set so I threatened to throw him over if he caught any more. That must had been the real deal because he caught only Stripers after that and ended up catching the largest fish of the morning. The boys did great this morning and should remember this trip for a long time. You can see it in the kids face nice work Jim!